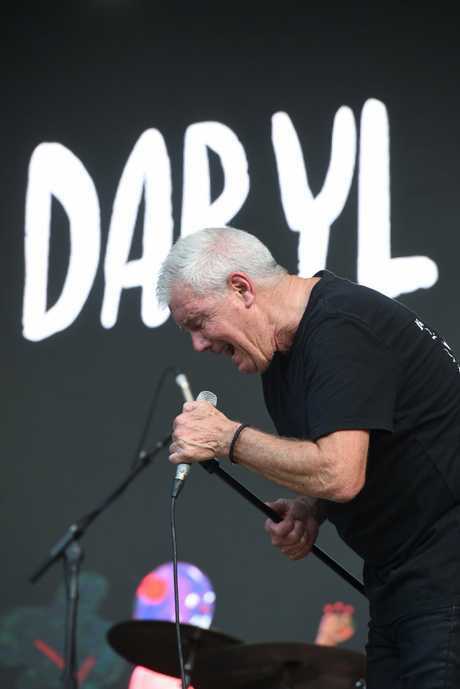 ON the first day of Falls Festival Byron Bay 2017-18, it was not Flume or Thundamentals that the crowd was talking about at North Byron Parklands, it was 'Daryl'. PHOTOS: Have you been snapped at the festival? And they all wanted to hear The Horses, Daryl Braithwaite's 1990 cover of the song released by American star Ricky Lee Jones on 1989. 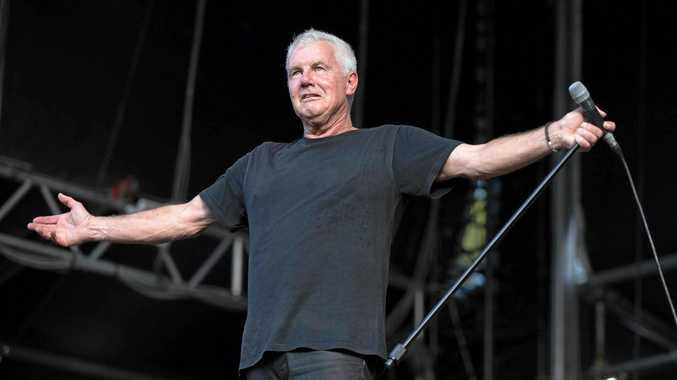 Almost 30 years later, and about to turn 69 on January 11, Braithwaite was the highlight of the first day of the Byron leg of the music festival. 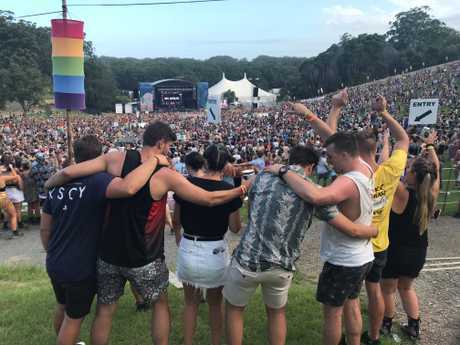 Thousands descended into the Valley Stage to see the artists, friends and families held together listening to and singing the iconic song out loud. 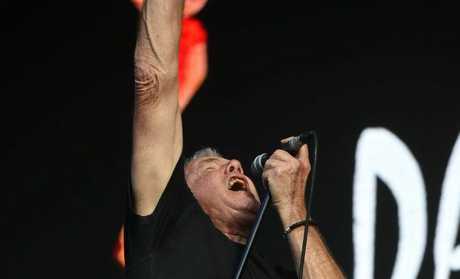 The Horses at Falls: Crowds react to Daryl Braithwaite singing The Horses at Falls Byron Bay 2017-18. 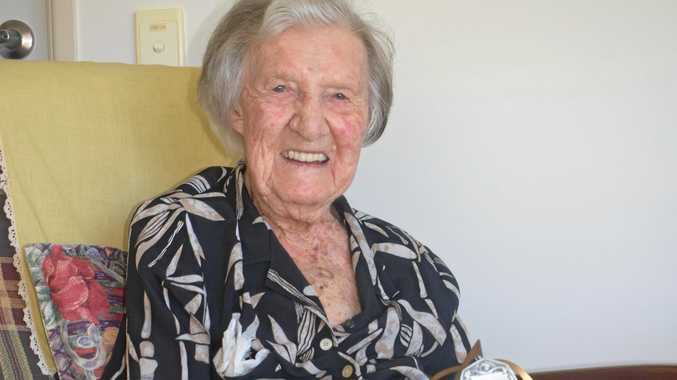 It was 'a special moment' shared by thousands. 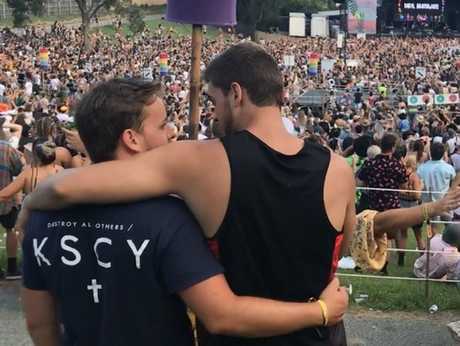 A very special 'bro' moment, for some. Half an hour before going on stage, Braithwaite discussed The Horses, surfing in Byron in the 1960s and his new music project. People out there are hungry to hear your music, particularly The Horses. After all these years, do you understand why it's become such an Australian anthem? I know the song has had longevity, but even on Saturday when we did the Lorne (Victoria) leg of Falls, our first ever Falls experience, and these people were young, they could be my grandchildren, and they sang it, they sang it loud. As soon as the song started the whole place went bang! and we thought 'my god'. After doing this for son long, to have this kind of reaction and acceptance, it's quite phenomenal. How did you have the original idea of covering The Horses? My version is different to Ricky Lee Jones and it's at the end of the Rise (1990) album. For some reason I got home, put on her CD and the first track was The Horses. I really liked it and thought we could do a version of it. It was never meant to be a single, but I think it was Sony that looked at it and decided to make it the third single of Rise. What is it about The Horses that resonates with so many people and across all ages? I get emails and messages on social media asking me to play it at wedding s and funerals. I recently went to the funeral of a friend of mine and they played The Horses because she loved it so much. I even asked Ricky Lee if she knew why the song is so big, and she said 'it's a beautiful song', but also think it's a song about reaching out, full of ethereal stuff, and I'm sure there is people who don't like but but those who do, they love it so much! I'm really fortunate of bring the recipient, and the band and I have seen it grow over the past 29 years. What are your memories of your earliest gigs in Byron Bay with Sherbet? I surf so our big trips away were always to Byron. We came up here in 1965 and we camped in the car down at The Pass, which now is unthinkable! We absolutely loved it. We came from Coogee in Sydney so Byron was 'the' place. We were only 16 or 17. What is next for you musically speaking in 2018? I think I'd like to do an EP of new material, keeping the same style of pop music that we do, and hope that something gets played. I have some ideas but it's always a challenge, specially being old school - and I am sure it's a challenge for new bands as well - but we are still very happy playing live. Let's listen to The Horses one more time, shall we? For details visit the Falls Festival website.